The #1 recommended brand for topical magnesium therapy in the world. of all the sources we’ve tried, ancient minerals is one that delivers fastest, most potent therapeutic benefits. A cornerstone for achieving vibrant health. Often revered as the “Beautiful Mineral” in Chinese Medicine, magnesium is as essential to the body as water and air, with its beauty easily attributed to its absolute and undeniable healing power. Although there are only several ounces of magnesium in your body, it is implicated in hundreds of biochemical reactions in the body, scores of which contribute to the manufacture of energy and cardiovascular function. Strong bones and teeth, radiant skin, balanced hormones, a healthy nervous system, and much more – all made possible by magnesium sufficient cells. While there are tremendous volumes of research paying tribute to the efficacy of magnesium supplementation in a wide range of health enhancing applications, not much attention has been directed at the method of delivery. 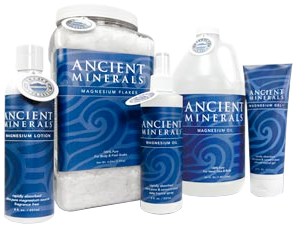 Ancient Minerals brand magnesium products utilize an ultra-pure, highly concentrated form of naturally occurring magnesium chloride along with other trace minerals, for topical use in the form of magnesium oil, magnesium gel, and magnesium bath flakes. Why topical? Because the skin is a living, breathing organ, and is not only the most efficient organ for detoxification, but also holds tremendous potential for re-mineralizing the body as well. So, what happens when you utilize the human body’s most well functioning organ for absorption of one of the most life giving minerals available? A cornerstone for achieving vibrant health. For more in depth information, please visit www.magnesiumforlife.com. From a depth of nearly 2 miles beneath the earth’s crust, the source of Ancient Minerals is drawn from the Ancient Zechstein Seabed, a geological formation in Northern Europe from the Late Permian Era. Isolated for the past 250 million years, Genuine Zechstein™ magnesium stands alone as the purest and most pristine source of natural magnesium salts in the world, and a mark of purity on every bottle of Ancient Minerals. For more information, or to view a current lab analysis, please visit www.genuinezechstein.com. The original and still the most popular, Ancient Minerals Magnesium Oil, contains only raw, highly concentrated, ultra pure magnesium chloride and other trace minerals drawn from the Ancient Zechstein Seabed in Northern Europe. There are no added ingredients except those found naturally occurring in the deep underground deposits from this pristine source. 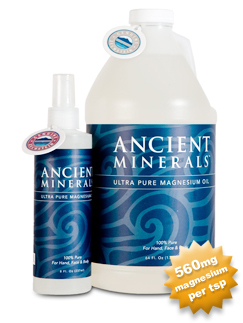 Ancient Minerals Magnesium Oil is considered the gold standard by practitioners for rapidly restoring cellular magnesium levels and is easily absorbed into the skin and underlying tissues. One teaspoon contains approximately 560mg of elemental magnesium. Consult our magnesium oil application guide for details on product usage. Ancient Minerals Magnesium Gel Plus combines the healing power of magnesium chloride with biologically active, certified organic aloe vera extract (ACTIValoe®) in therapeutic amounts. Due to its gelled composition, this unique formulation lends itself for the ultimate applications that require tissue manipulation such as massage therapy, while still delivering high amounts of magnesium into the tissues. 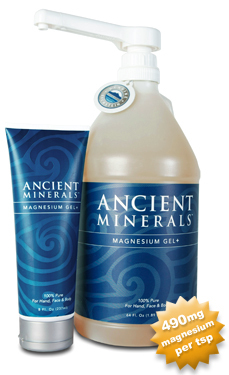 Ancient Minerals Magnesium Gel Plus is also ideal for addressing various skin conditions such as psoriasis, eczema, dermatitis, and acne, in addition to offering a broad range of benefits for skin tissue. While the benefits of aloe to the skin are well known by most, the application of magnesium chloride to the skin has shown marked benefits for enhancing skin barrier function, reducing inflammation, speeding wound healing, and augmenting skin cell hydration. Please note that this magnesium gel is unique in that is not designed to be fully absorbed into the skin. Consult our magnesium gel application guide for details on product usage. 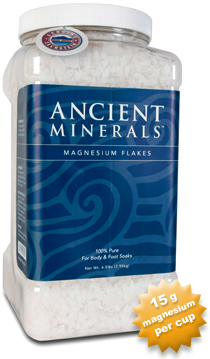 Ancient Minerals Magnesium Bath Flakes are the dry flakes of magnesium chloride and other naturally occurring trace minerals, in a convenient and economical form for utilization in baths and foot soaks. Ancient Minerals Magnesium Flakes dissolved in warm water provide the user with a medicinal bath of cell restoring magnesium chloride. Some individuals with sensitive skin may prefer this method of application, rather than the more concentrated Ancient Minerals Magnesium Gel or Magnesium Oil. Ancient Minerals Magnesium Bath Flakes are also highly effective for healing skin conditions such as psoriasis, eczema, and dermatitis. Soaking in magnesium salts has been shown to markedly improve skin hydration, speed wound healing, enhance skin barrier function, and decrease inflammation. One cup contains approximately 15g of elemental magnesium. Consult our magnesium bath application guide for details on product usage. “There are many magnesium chloride products on the market. Some are natural ones taken from the sea, others are taken from brine flows at certain lakes, and now we find a sea of it 1500 meters underground in Northern Europe that is hundreds of millions of years old and is as pure as can be. I am just finishing my third book on magnesium, being somewhat of a pioneer in its transdermal and oral use together. I have also written an essay called the Science of the Pure and many of my books deal deeply with mercury poisoning and the science of low level toxicity. So when I put my endorsement on the Ancient Minerals product line, it is with intimate knowledge that this magnesium source is the purest most potent medicinal in the world. I am still amazed how inexpensively they have brought Ancient Minerals bath flakes to the market. LL Magnetic Clay has made it available and affordable to many an exceptionally pure form of magnesium chloride.”- Mark Sircus, Ac., OMD Marc Sircus, Ac., OMD, is an author, a nationally certified acupuncturist, honorary doctor of Oriental Medicine, and a founding director of the International Medical Veritas Association (IMVA). His book, Transdermal Magnesium Therapy, explores groundbreaking information in the use of magnesium chloride transdermally. For more information on magnesium therapy and to learn more about Dr. Sircus, visit www.magnesiumforlife.com. “We have been using magnesium chloride oil in our health and healing programs for nearly ten years, and we get consistently positive, sometimes very dramatic, results with it, especially when used transdermally. Of all the sources we’ve tried, Ancient Minerals is the one that delivers the fastest, most potent therapeutic benefits. It contains essential elements that no longer exist in ocean water today, and is totally free of any toxic contaminant. In addition, Ancient Minerals seems to have subtle energetic properties due to millions of years of subterranean activity. We highly recommend this product for both preventive and curative health care.” – Daniel and Snow Reid. Daniel Reidis a bestselling author and a leading expert on eastern philosophy and medicine. He has written numerous books and magazine articles on various aspects of Asian self-health and self-healing practices, and has established an international reputation for the practical efficacy of his traditional approach to modern health problems. For information on Daniel Reid, visit www.danreid.org. I have been massaging five of my clients up to three times a week with the Ancient Mineral Magnesium Gel for a month now. I found the oil is a little too potent for direct massage on many elderly clients with thin skin especially in light of thinners, etc. The magnesium gel is much better received. For nearly four weeks one of my 86 year old clients has been receiving the gel on his legs arms shoulders and chest via massage three times per week only. Some of this client’s maladies were: practically non responsive 90% of the time; difficulty walking; latter stages of retinal neuropathy; and was in consistent excruciating cervical pain. Recently he has been walking to the bathroom unaided and started reading again for the first time in a year. My client has not complained for over a week about his neck. He converses much more, and is more responsive. These are not my observations only. The home care nurses have all remarked upon the miraculous recovery he has made. I would love to take credit for it, but my massage has not changed. The only thing that has changed in my clients vast medical protocol and diet preparation … is the Ancient Minerals magnesium gel. I am amazed. I have 28 years of massage therapy experience and so far what I am anecdotally observing regarding this magnesium gel is very impressive. I have been searching for a viable magnesium vector for my clients and now I have it. Thanks! I’m certain my magnesium level has been low for a long time and while I cannot relate my experiences with the Ancient Minerals transdermal magnesium through medical testing, my observation is that it has helped to resupply my magnesium level. I no longer have the leg aches or cramps I used to have and I’m sleeping better at night and do not seem to have as much tension. These are great benefits! In the past, I’ve used two other types of transdermal magnesium from other companies, one being a gel and the other an oil. I’ve found the Ancient Minerals transdermal is not as irritating to my skin. It definitely absorbs into the skin better and it doesn’t make me itch like the other transdermal products I’ve tried. My preference is to rub it onto my skin right after a shower and wear it throughout the day. I never could have left the other two magnesium products on throughout the day as I do with the Ancient Minerals! I always had to wash those types off after no more than 30-60 minutes of wearing them because they either didn’t soak in properly or they made my skin itch as well as feel like it was burning. I’ve found the Ancient Minerals can be put on areas of soreness, for example an aching knee, and it does seem to help take the general aches out from that area. My conclusion is that it is the best transdermal product available on the market (at least that I know about) and seems to be more pure than others I’ve used. Well, I have to tell you the Magnesium spray really saved me last night and this morning. The Chantix or something has thrown me into bad cramps, and I stopped the cramps with the Magnesium spray last night, spraying and spraying away on my tummy! I slept like a baby! Then this morning I woke with bad cramps, the kind that put me into seizure mode, and again the spray held everything at bay. So I’m going to up my magnesium spraying quite a bit. I knew the Chantix drained it from my body, and I’ve been doing a lot of oral magnesium, but the spray gets there so much better!!!! Before magnesium oil, I used to experience debilitating, and excruciating monthly cycles, whereby I would be laid up for the first day, feeling sad and sorry for myself. Announcing to all and sundry “I’m in the cave and if anyone wants me …..bring water and Panadol.” In fact I was unable to take pain killers as they would just come right back up again. This had been going on for 10 years. After using the magnesium spray for only two weeks, I wasn’t expecting any miracles. But alas, the “Miracle of Magnesium” is real…I did not need to take any pain killers as there was NO PAIN whatsoever, a mild twinge at best…so I simply applied some magnesium chloride oil to the abdomen and it vanished in minutes. And this is after only two weeks!! From time to time I also experienced the odd migraine….once again laid up… so surreal and intense that I often felt I was leaving the body, and had to get my husband to simply hold me to keep me grounded. But here’s the good news. I have not had to even a minor headache since taking mg. All my migraine suffering friends will attest to the same positive results. I have been a certified massage therapist for the past 4 years and operate my own private practice. Since opening my business, I have tried almost every massage lotion, oil, gel, cream, etc. out there and I’ve never found the “perfect” one…until now. I specialize in deep tissue massage so I was always finding that the products I purchased were either too oily or even too dry with not enough glide to help me perform at my optimal level. I started using Ancient Minerals Magnesium Gel for the last month on most all my clients and the results have been fantastic. My clients love the fact that on top of receiving therapeutic work in the form of massage, they are also receiving magnesium transdermally. One of my clients has been suffering with fibromyalgia for the past year, and she has come every week for the last month and she has never felt better. She can sleep through the night and her pain level has decreased drastically. For someone who came to me every week just to get through the following couple of days, can now last the entire week feeling better, which to her means the world. Another client of mine has had severe psoriasis since moving to California 15 years ago, I suggested to her that we should start applying the Ancient Minerals magnesium gel during the massage to see how she reacts to it. So far, in the last 3 weeks, she hasn’t had a new outbreak, and the areas on her body that were bad are greatly improving. She is very excited to continue using the product to heal her psoriasis. I want to take to take the time to thank you for making such a wonderful product that I plan to use in my practice indefinitely. I’m excited to see the clients that come into my office receive even more health benefits and improvements than from my bodywork alone. My daughter has Autism, and she is now 12 years old. We recently tried the Ancient Minerals Magnesium Bath Flakes – we used it when we were out of town for a family wedding, hoping it would keep her calm and able to handle all of the new people, places etc… I have never seen her behave so well as she did at that wedding. A child who usually shies away from crowds was actually dancing in a room full of people. For me the night was flooded with compliments on how fantastic she looked (normal even!) But I know I must give the credit for that day to the magnesium bath we gave her the night before – she has never been so calm and relaxed! Thank you for making such a special day for our family enjoyable to everyone! I have been on a medication called Baclofen for severe muscle spasms. This medication is primarily used for spinal issues. I have also been prescribed Neurontin a medication used for neurological disorders. I am driving my doctors’ nuts, so you might say that I am crazy. Just ask my wife. The doctors are puzzled with what is going on with me. The spinal docs and the brain docs are trying to determine if these cluster seizures are spinal or neurological. These spasms are most frequently small in number throughout the day, yet very discomforting. On bad days I can get up to 200 a day and in clusters of ten to fifteen leaving me at times unable to move. Stress and fatigue seem to accentuate the amount of them and the intensity of each. These spasms are so difficult that it takes all my wits to lull them in to a controllable state. I thought it would never be possible to overcome this state of being. I was succumbing to the fact that pharmaceuticals would be my last and final resort. I have tried numerous naturopathic protocols, none of which seemed to solve the discomfort while the spasms continued to worsen in both intensity and occurrence. One of our decisions for a detox protocol was to acquire some of your fantastic clay baths we had been hearing about. With our shipment came a sample of the Ancient Minerals liquid magnesium oil in a spray bottle for topical use and a book by Dr. Mark Sircus on transdermal magnesium therapy. I have tried magnesium in capsule form with calcium as suggested by one of my doctors. It gave some relief, until the spasms intensified. At this point destined toward heavy medications, I thought what do I have to lose. Within two days of the first application of spraying my entire body with magnesium both days, the spasms subsided. It is still very early to say that this is it, but in life’s little synchronicities through a series of unknown events myself and your liquid magnesium have come together to enrich my life. I can’t even begin to tell you what this simple mineral has done for me. Within a short period of a couple of weeks I am a different person. No longer am I chasing an elusive creature taking over my life and leaving me in shambles. I am calm and at peace, no longer am I preoccupied with just trying to be me. There is just simply, not enough I can say about the Ancient Minerals magnesium chloride oil with the exception of thank you! Thank you very much! My name is Christine Gable, and I am writing to you about my experience with Ancient Minerals, specifically the magnesium oil. I have had RLS for six years now, and was beginning to wonder whether this was something I had to live with for the rest of my life. I have been to four different doctors, and all of them had different ideas as to what was causing this, including one who said it was stress. The only stress I had was from the RLS, so needless to say, I was not too happy with that diagnosis’s I am not a big fan of pharmaceuticals, but after you have had this problem for any length of time, you are just about open to anything that remotely sounds like a fix. I have tried everything from painkillers, anti-depressants, muscle relaxers and hot baths every night. I even tried yoga, because one of my friends told me that stretching would help. My lack of sleep is probably my worst problem, as I have to go to work every day, and by the time lunch comes around, I am so tired that I can hardly keep my eyes open. I have also taken to sleeping on the couch most of the time, because I keep my husband awake. The rest of the story is good news and it all because I accidentally found out about Ancient Minerals. I attended a networking meeting through my company a couple of weeks ago, and was lucky enough to get to know the lady beside me. I shared with her the fact that I had RLS, and she told me about using Ancient Minerals for her fibromyalgia. She suggested that I try it, and that it might just help. Well, I purchased the small size and used it a couple of days. The first day I noticed that I was actually able to sleep for a straight four hours (that’s alot for me!). That was amazing in itself, but it just kept getting better. To make a long story short, I am now sleeping 7-8 hours a night, in the same bed with my husband and the six year problem seems to be a thing of the past. Just wanted to thank you for an excellent product, and I hope that the RLS community finds out about it sooner than I did. For about the last 10 years, I would get migraines at least 2 times per week. These migraines were debilitating, I couldn’t sleep, eat, work….nothing. I would just lie in bed with the lights off and just hope it would go away. My doctors, at the time, put me on every medication you can think of that was supposed to help migraines. I was also on a migraine preventative everyday. They were so bad I even resorted to things like Vicodin and Percocet, just to take the edge off. I tried weekly massages, ice, heat, baths, and acupuncture; I was doing anything and everything possible to get rid of it. Although these treatments would help, they were only temporary. One day, I went to my weekly massage appointment. I walked in and my therapist was so excited to see me. She said that she is now carrying a product called Ancient Minerals Magnesium Oil and Gel and that she wanted to try the gel in my session instead of a lotion. She called it “Magnesium Massage”. She said that she had done research and that magnesium chloride helps with migraines and that my migraines are most likely a cause of severe magnesium deficiency. I figured, why not. I would’ve tried anything at that point. After my massage session, I already started feeling better. My therapist gave me a sample of the oil and some literature and suggested that I should try applying the oil on daily, so I did. As soon as my sample was finished, I knew this was a product that I could not go without. Every week my normal deep tissue massage sessions were now always magnesium massage sessions and I purchased the half gallon from her. I have used it for about 60 days now, and not ONE migraine, not even one headache. This product is amazing and has completely changed my life. I don’t have to miss work, I sleep like a log, I’m happier and more stable all because of one mineral that I was deficient in. Why this wasn’t recommended to me earlier, I will never know. My name is Ned Barlowe, and I live in Thompson Falls, Montana. I am 67 years old, and up until about a year ago, I could shovel the snow out of my driveway without too many problems. Thompson, Montana gets a lot of snow, so I shovel on a regular basis around here. Well, about a year ago, I started having back problems that have just been getting worse as the days go by. It has gotten so bad that I already know that I am going to be laid up in bed for at least 3-4 days every time I clean that driveway off. The wife and I can’t afford to hire someone, so I have to do it, or we can’t get out to get our groceries or do our errands. Last month, I saw an ad in a health magazine that we subscribe to for your Ancient Mineral products. I ordered the magnesium chloride oil and a jar of flakes, because my wife likes to take baths. It got here pretty quick, and I tried it first. I put on the oil three days in a row, and then I had to shovel that driveway again. I was all ready for the pain and the three or four days in bed, but got the surprise of my life. I not only skipped the pain, but I felt pretty darn good! In fact, I felt so good that I offered to clean the lady next doors driveway, too; as she is a widow and does not have much money either. Just wanted to thank you for the great products and the help it gave me. There are so many products out there, that sometimes you just don’t know which one is going to work. Keep up the good work, and I will keep shoveling my driveway.